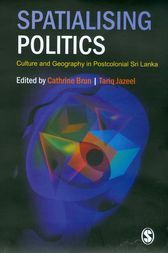 Spatialising Politics: Culture and Geography in Postcolonial Sri Lanka brings together a collection of essays that take as their theme the spatial politics of Sri Lanka. It highlights the importance of space in the ongoing ethnic conflict fuelling Sri Lanka's continuing civil war and invokes a number of aspects less frequently cited in the dominant approaches to understanding postcolonial Sri Lankan nationhood and identity. The essays in the volume examine the role of 'spatialities' often occluded within the debates on Sri Lankan politics—amongst them, cities and built-space, diasporic productions and imaginations, commodity cultures and their concordant networks, knowledge spaces and 'foreign' interventions, landscape and sacred spaces. Situated at the intersection of human geography and postcolonial studies, the book signals the ways that postcolonialism and geography are intimately linked, their intersections evoking the social, spatial and political effects of enduring colonial representations and materialities. The book will be of immense relevance to postgraduate students of human geography and South Asian studies, and will find enthusiastic readership amongst researchers in related disciplines, such as cultural studies, anthropology and sociology, who are interested in the spatial turn in postcolonial theory and its approaches to conceptualising nation, identity and belonging.